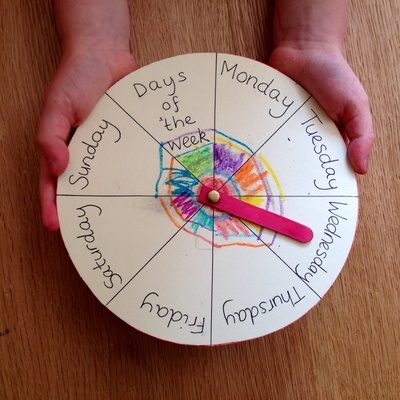 Here's an easy and effective way to make a 'days of the week' wheel for preschoolers. They can turn the dial in the middle to the right day, and can explore 'tomorrow', 'the day after tomorrow', 'yesterday' etc. 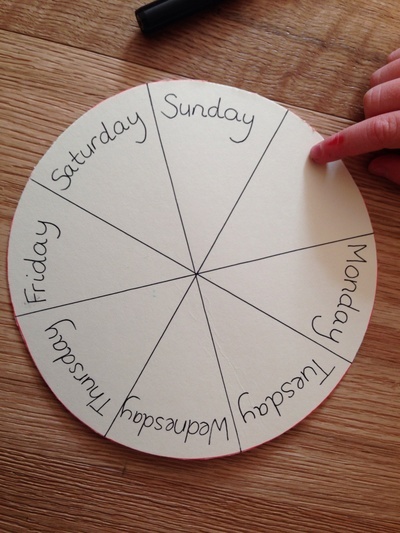 Cut a circle out of thick card or use a paper plate. 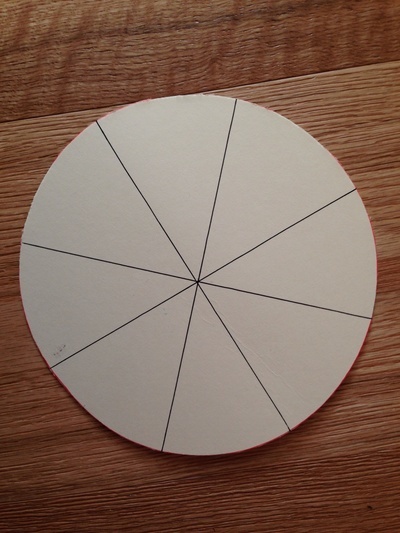 Divide your circle into seven or eight wedges with ruler and pen. Seven wedges looks neater as you have one wedge for each day of the week. However, eight wedges is quick and easy and you don't need to measure (just divide into quarters then divide each quarter into two pieces). 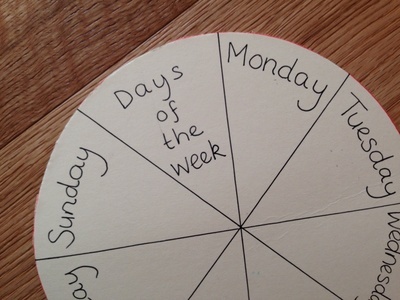 Write a day of the week in each wedge. If you made eight wedges you could write something like 'Days of the week' in the spare wedge. Preschoolers can have fun colouring the wedges in with crayon. 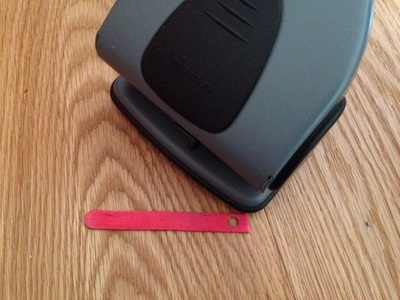 To make the dial, first cut off the end of a popsicle stuck with scissors to get the right length. Make a hole in one end with a hole punch. 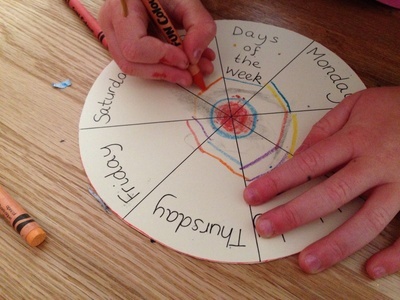 Make a small hole in the centre of the card wheel with a skewer. 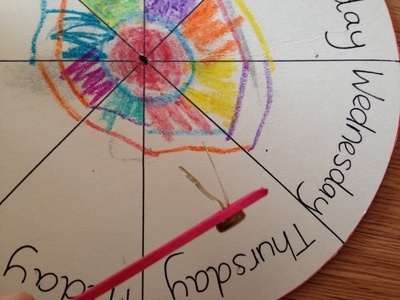 Attach the popsicle stick dial to the wheel with a butterfly fastener through both holes. 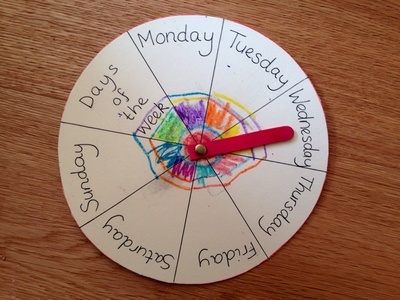 Your 'days of the week' wheel is now ready to use. Have fun!